In this week’s flashbacks, Zelena is celebrating her birthday (or the day her mother abandoned her) when the winged monkey brings in the scarecrow whose brains Zelena needs as part of her time travel spell (remember that one, from way back in season 3? ), but an adult Dorothy returns to Oz and saves the scarecrow (because she has the love of the people). Hades pops in to help Zelena because he would like some of that time travel spell as well so he can get back at his own goody-too-shoes sibling, Zeus (you’re not that different you and I). The two attempt to find Dorothy by enchanting her bicycle to lead them to Dorothy where Zelena manages to get the scarecrow back. Back at her house, Hades had organized dinner to celebrate, and he tells her that he’s not going back to the Underworld because he has fallen in love with Zelena (one bike ride was all it took and my eyes rolled back into my head). He tries to do the whole true love’s kiss on her because that will break Zeus’ curse on him and turn him back into a man, but Zelena didn’t trust him and sent him away. So back in Underworld, Hades is using Rumple’s baby contract as leverage in order to get him to make a portal for him, apparently Hades can travel easily through realms but he cannot bring anyone back with, but with Rumple and Hades working together anything is possible. In Storybrooke, Zelena tried to pose as the Blue Fairy in order to get access to her baby (you know, desperate times), but Belle catches her out and tries to stop her. The portal opens in the middle of the nunnery and Belle jumps in with Zelena’s baby and naturally Zelena jumps in after her. But once they work out that they landed in Underworld, Belle makes a run for it with Zelena’s baby (prayer circle for the sessions of therapy this child will need to undergo, everybody just clear Archie Hopper’s schedule). Zelena figures that Hades wants the baby in order to complete his time travel spell, and she tries to protect her child, only to discover that she will only endanger the child further so she allows Robin and Regina to take care of the baby (the two people who left it in Storybrooke well they gallivanted to help Emma, when I don’t think Emma was in desperate need of Robin’s help). A meeting with Hades in the town square helped Zelena to discover that the real reason he wanted her baby was because he wanted to protect it from the Storybrookeans, he wanted to keep her safe for Zelena because he still loves her. He offered to help go and get her child back but she declined his help and said she wanted to do it on her own, and he told her he would wait for her. So sweet. He also said he created Underworld to look like Storybrooke because he knew she always wanted what Regina had, what a way to feed into her unhealthy habits. I do think that even if Zelena wasn’t a 100% keen to be his Underworld queen she could have at least kissed so that he would be made human again and put us all out of our misery, but who knows how the mythology will change next. Rumple also had some honest moments with Belle where he told her that she’s pregnant, that he had already signed away the child and that’s the Dark One again. But he basically was like #SorryNotSorry, you will accept me as I am. I appreciate him being honest, but after a tirade of lies, Belle should be packing up her book bag and leaving. The scarecrow was terrifying, and I was glad to see it die. I was 100% sold on the Zelena/Hades relationship, it just happened too fast and I couldn’t really bring myself to care, I just sighed at another over-complicated relationship. At this point, I don’t think Regina and Robin are much better guardians for the baby, they choose to go on quests and just leave the baby at the nunnery. 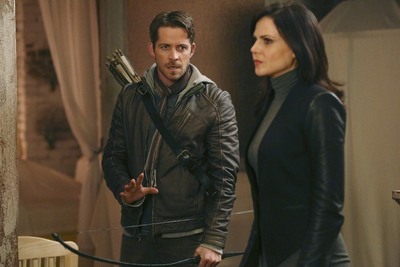 At least, Snow and Charming were going to help their daughter, one can argue Regina was helping her friend, but Robin Hood could have stayed home with his kids. How is baby Neal still a baby? The Blind Witch tells Snow and Charming about this phone booth where they can communicate with the living (Level 1 hauntings) and they talk to baby Neal a little bit. Henry is apparently sleep writing in beautiful sentences, the pen is just recording all the events like what Hades is up to, and Neal hearing his parents’ voices, the pen is very convenient.